Sandra Leduc is an attorney from Canada who quite literally just finished scaling the world's highest mountain. She also live-tweeted her ascent. There are many routes to climb Everest, but there are two, in particular, that are most used. The South Col (pass) and the North Col are the two paths most traveled to the summit—the South from Nepal and the North from Tibet. The South Col requires multiple passes through the Khumbu Icefall—which is like a waterfall only it's ice and moves much, much slower—like, meters a year slower. Despite its lack of speed, it can move quickly and suddenly and it is considered the most dangerous part of the climb—found not far above base camp. Leduc climbed up the South Col with an unguided expedition group, though she did hire a personal Sherpa. She left Kathmandu on April 10 and on April 14, her Sherpa was helicoptered off the mountain because of a broken jaw but according to Leduc is recovering. Her tweets are a mix of pure joy and determination and the numbing rawness one would expect from tens of thousands of feet above sea level. She experienced many setbacks and saw things that sound absolutely terrifying and disturbing, but she also kept upbeat—making jokes about Snickers bars, watching Indiana Jones and fantasizing about the creature comforts once she was done. 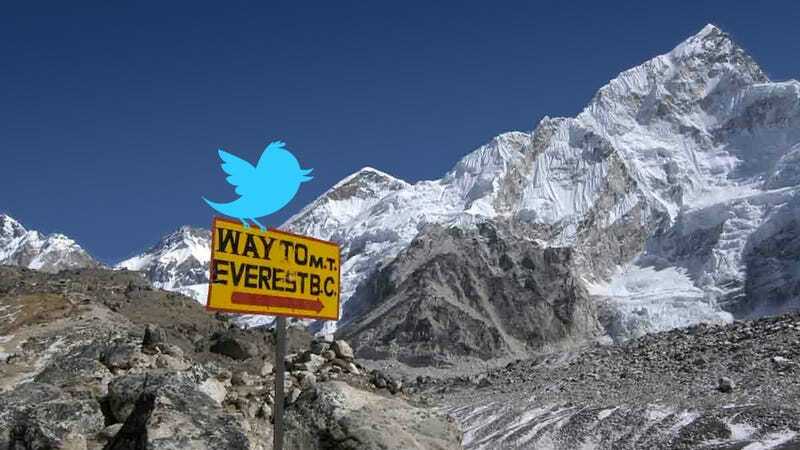 Early this morning she tweeted that she had successfully summitted Mt. Everest. Here's a collection of her tweets.